Newborn nails are ugly. Face it. They’ve got hangnails, rough corners, and the CUTICLES! Amniotic fluid is not good for nail beauty. When presenting your child to the world, it’s the details that really matter. That means getting those nails buffed, polished, and photo-ready immediately after birth. You absolutely must request your hospital perform a mini mani-pedi on your little one as soon as they’re done with the initial exam. God forbid you actually capture a snapshot of ratty cuticles! I highly recommend picking up your own mini polish, made especially for newborns. You can snip off extra brush bristles for more control, and it dries especially fast (which is important because since legislation passed in 1997, you aren’t legally allowed to strap down your child for the procedure). It’s important for one of the hospital professionals to take on the task in this case because this will ruin your OWN perfect nails! Remember, your daughter is a reflection of yourself, but you are your own ultimate representative. Your daughter will thank you for saving her from a lifetime of embarrassment and your friends will envy your attention to detail. 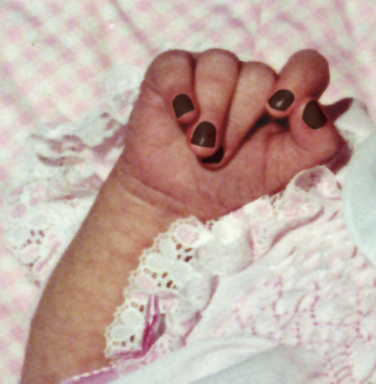 This entry was posted in Uncategorized and tagged manicure, nails, newborns. Bookmark the permalink.